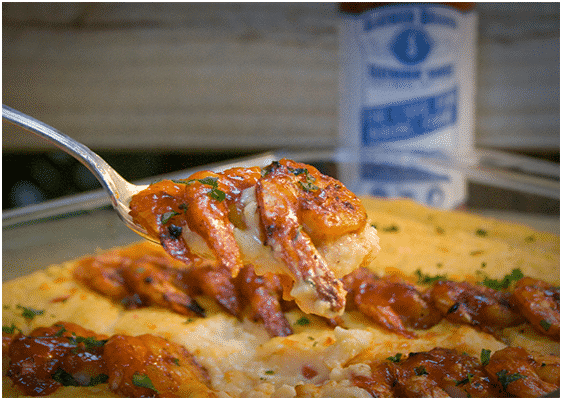 Nothing says true Southern more than a Lowcountry Shrimp and Grits recipe. Entire cookbooks from award winning chefs have been written about this dish with all its variations and cooking methods. Although there is an abundance of amazingly delicious Shrimp and Grits recipes, I chose to share this one because Slathered Shrimp and Grits is more than delicious ingredients melded together yielding a taste that tantalizes the palate. There is story behind each layer of this recipe. It represents an evolution and culmination of over 100 years of cooking history and draws on my rich family heritage. It is one of my family favorites and one that I am proud to share with you. 1 cup roasted, peeled, seeded, and chopped red bell pepper. Bring water to boil in heavy-bottom stockpot. Slowly add grits, stirring constantly. Reduce heat to low and continue stirring to prevent grits from scorching. Once grits have started to thicken continue cooking over low heat for another 30 minutes, stirring frequently. Add remaining ingredients and continue cooking for about 10 minutes until cheese melts and roasted peppers are well blended. Grits should be very creamy and smooth. If mixture is too thick, simply add water ¼ cup at a time to get desired consistency. Season grits to taste with salt and pepper. Keep covered and warm until ready to serve adding water as needed to maintain creamy consistency. You can use store bought roasted peppers, however I prefer to roast my own. Roasting peppers is very easy to do and un-used portions can be refrigerated and used for other recipes. Rub washed and dried peppers with olive oil and place on baking sheet in top rack in oven. Roast for about 25 to 30 minutes turning once or twice until skin is blistered and charred in some places. Remove peppers from oven and place in bowl covered tightly with plastic wrap. Let cool for 10-15 minutes. Peel the skin, remove stems, cores, and seeds. While grits are cooking, place bacon slices on foil lined baking sheet and place in 350 degree oven until crispy. Remove from oven, drain on paper towels, crumble and set aside. Place oil in heavy bottom saucepan over medium high heat; add shrimp and stir, moving shrimp to sides of the pan. Pour Slatherin’ Sauce in the middle of the pan. Sauce will quickly begin to caramelize. Fold the sauce and shrimp together in the pan for about 3 minutes until shrimp are thoroughly cooked but being careful not to overcook. Spoon hot pimento cheese grits on plate. Top with heaping spoonful of Slathered Shrimp. Generously sprinkle with bacon crumbles and finish with sprinkled chopped parsley. The colors and smells are beautiful and the taste is amazing, so don’t be surprised when you family ask you to “Slather It On” more often!